First off I'd like to thank you, my dear readers and friends, for the heartfelt and soothing comments you left on my last post. Your kindness was a balm to my aching heart and was deeply appreciated. We're getting a bit used to the new normal of no little golden furry friend with us all the time. I am looking forward to starting a new crochet blanket on Friday with Lucy at Attic24 blog. She designed the blanket, selected the colors which are sold as a package at Wool Warehouse, an online yarn store. This one is called the "Sweet Pea Trellis". This will be the 4th "Lucy blanket" I've made. This one leaped out at me for the pretty colors and the unique design, to me it does look like a trellis with pretty sweet pea flowers growing up. 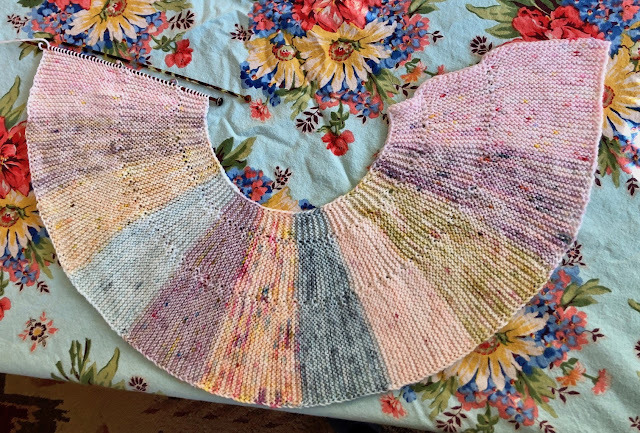 My first one was a rainbow granny stripe, then a smaller one where the colors merge in an interesting way, the last one the Woodland blanket which I've thoroughly enjoyed. I've added two more sections in my cowl by Alicia Paulson, I'm trying to get it done before Friday but that's not looking like it will happen.. but you never know. The vet clinic made this for us and Dayle brought it home, you have to bake it to harden it which we've done. I get all emotional looking at it.. but I'm glad they did it for us. Kristi made a Christmas ornament similar to this last year which I will treasure. I'm heading back to the pool today. I had to miss several weeks of lap swimming when I was ill with bronchitis, I got better but didn't swim during the holidays because.. umm.. well.. I didn't feel like it. BUT.. today is the new year so I'm packing up my swim bag and getting back into the swim of things. Lucy always designed the most colorful projects, doesn't she? Your new blanket will be just lovely. and, nice progress on the cowl. Good for you getting back into the swim of things - lol. I need to do SOMETHING to get moving. I really wanted to walk yesterday, but that did not happen. 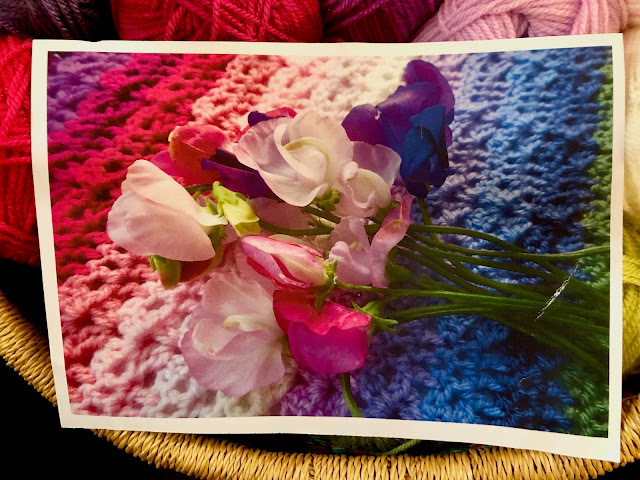 I am doing the Sweet Pea blanket as well.. I am so very sorry for the loss of your sweet pup. As a fellow pet owner who has been through what you are going through now, I know how you feel. Be comforted in knowing that no one could have loved Buddy as much as you all did and rest assured that he knew how much he was adored. It takes a while to get used to the space our pets leave, doesn't it? Wow... you 've made great progress on your cowl, almost done! I can't wait to see your new blanket, those colors are gorgeous! 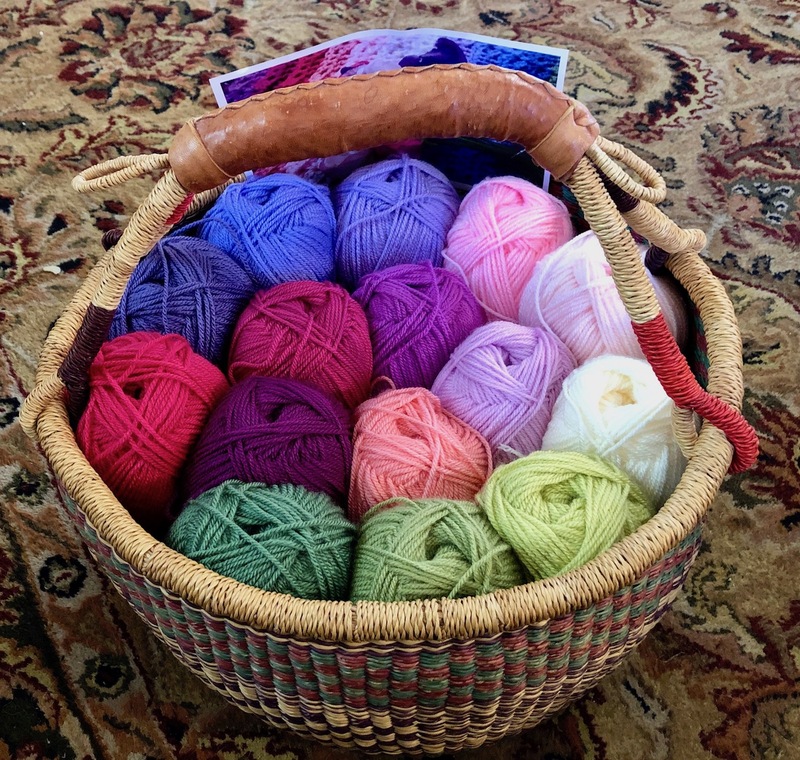 That basket of yarn is a basket full of SPRING TIME!!! Happy crocheting! What a beautiful thing to treasure and remember him by. I imagine it will be very precious to you always. So very, very sorry to hear about the loss of your sweet Buddy. One of our own passed over the holidays. It is never easy. They add so much to our lives. That is sure a lovely thing that your vet does for you. I wish our office did something like that. Unfortunately, all we have are memories of our fur babies and a lot of pictures too, of course. Your blanket is going to be beautiful. All of the springtime colors give me hope that the sun will eventually return along with some warmer weather. We have freezing rain predicted for tomorrow. Yuck! I’m starting a new physical therapist for my back tomorrow and I will receive an injection in my back on the 22 of Jan. I sure hope this works because it sort of a last ditch effort! If it does make things better, we’re planning a trip to the coast sometime in February or March. Maybe we can all get together for lunch or dinner as we go through Portland. your new yarn colors are pretty. I hope to start knitting this year as well! Hope you had a good swim. Way too cold today to go on a walk. BBRRRR! Phil just went on a walk and I've got a lap quilt over my legs while on my lap top! 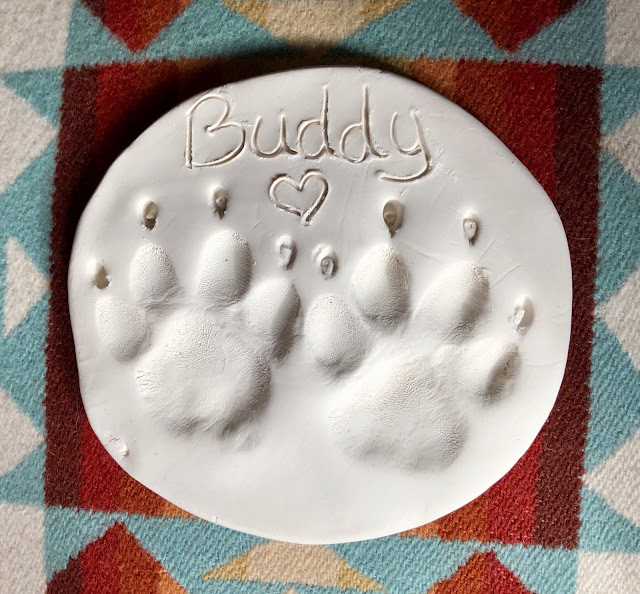 Nice paw prints of Buddy's. It is nice of the vet clinic to do that for their clients! Have a good new year! Wow, what a thoughtful thing for a vet clinic to do. I may suggest it to mine. When my cat died when I lived on a US military base in Japan, they said they would cremate her. Well it made sense, rather than bury. What I didn't know is I got her remains back in a small ceramic container placed inside a very ornate brocade fabric (stiff) bag tied in a very Japanese manner. She sits on my mantel. Its so hard to lose our pets. I send you all hugs. So sorry to hear about Buddy. He was a great dog.